This bright and sweet homemade ten-minute lemon curd is a cinch to whip up and will last for weeks in the fridge. You can use it for a variety of desserts! Cookbooks are among my favorite books, besides vampire romance novels and suspense thrillers. I go through seasons of genres when I read. Months of vampires and witches deciding whether or not to kiss, a whole Winter of medical suspense thrillers, or a week with a time-traveling Scottish woman. One thing I read year-round is cooking magazines. I have 100s of them! This is how this lemon curd came about. My most beloved cookbook is my Southern Sideboards. It was given to me by my mother-in-law at my first bridal shower. Not a very experienced cook at that point (I’m still not), she gave it to me so I could have a few of her favorite recipes to make for my new husband. She wrote an endearing paragraph on the inside of the front cover and graciously put a star next to her favorites. I am so thankful for this book because I have used it so much! Our Pimento Cheese Straw collaboration recipe and the first recipe posted on the blog was inspired by this book. 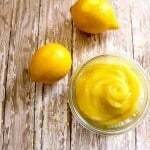 There are so many great recipes and this Lemon Curd is among them. If you have never made lemon curd from scratch and had only purchased it, you are missing out. It does take a few minutes and some patience while you are standing there stirring. But having some homemade lemon curd is totally worth it. The flavor of the lemon is so much more intense, bright, and the sugar taste isn’t in your face like the store-bought version. 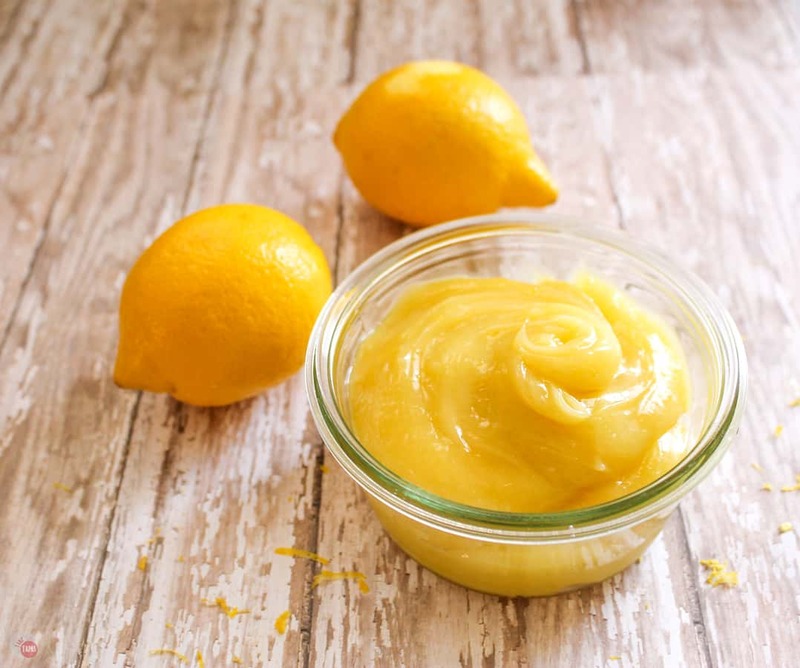 Making Homemade Lemon Curd is Easy! The color of homemade lemon curd is also much more vibrant. I found that using the free range eggs that have the slightly darker yolks make the yellow color of the lemon curd that much more intense. The store-bought version tends to be lighter in color and pushes the lemon flavor to the back. Simple and good ingredients make for a great final product. This homemade lemon curd is no exception. The recipe makes 2 cups so you can keep it stored in the fridge. Mine never lasts long because I tend to put it on everything. Including just a spoon that I then stick directly into my mouth. Making lemon curd at home is super easy and only takes about 10 minutes. A double boiler and a spoon are really all the equipment you need, along with the ingredients, that is. Lemon curd is just a slow and low cooked sugar, butter, eggs, and LEMONS! A double boiler is a pot with a little water (about 2 inches,) that is brought to a boil and then reduced to a simmer. A glass or metal bowl is set on top of the pot of simmering water without the bottom of the bowl touching the simmering water under it. A glass bowl is great for working with acidic recipes and you can see the water level under it. A metal container is best for a quick cooking recipe. A distance of about 3-4 inches between the water and the bottom of the top container is best. The top container should fit down into the bottom container slightly but not seal it completely or the steam from the simmering water below can cause an explosion! Keep the top container on the counter while you are heating the water and once the water reaches a simmer, place the top container on the pot and stir. If you heat both the top and bottom together, the top container might get too hot and burn the ingredients and your hands! Here is a great pictorial on how to set up one. When you are ready to make the lemon curd, just stir the ingredients together slowly until the lemon curd coats the back of a spoon and when you run your finger through it, a clear finger mark remains. If you are a stickler for temperature, the final temperature should be around 170F. You can use a thermometer to check the temperature and your lemon curd will turn out perfect every time! I decided to make Homemade Lemon Curd this time because of a chance meeting with a dessert at 30,000 feet above the ground. Flying home from Phoenix, Arizona last summer, my kids and I were blessed to be sitting in First Class. Years of my husband’s flying had accumulated enough points for us to fly this way. All that time away from home paid off. Among my meal for dinner was a carrot cake loaf. I thought this was going to be dry and tasteless as all airplane food is. Believe it or not, the cake was actually moist. But what really got me was the lemon and cream cheese drizzle that was on top of the cake. The drizzle was kind of a cross between curd and frosting. Almost like making a boiled frosting. I tasted the drizzle first and thought that it was out-of-place with a carrot cake. Boy, was I wrong! The combination of spice from the carrot cake, the richness of the cream cheese, and the brightness and acidity of the lemon was amazing. That little bit of lemon brought the whole cake full circle and made it all seem right. That gave me an idea! Here is the recipe for an easy, homemade, 10-Minute Lemon curd. Check out my Mini Carrot Cake Cupcakes to see what I did with it! This light and tart lemon curd is easy to make, has 5 ingredients, takes 10 minutes, and can be used for countless dishes and desserts! Make a double boiler on your stove top. Instructions below. Add eggs and egg yolks to double boiler and beat, with a whisk, gently until white and yolks are combined. Add the rest of the ingredients and stir with a wooden spoon until the mixture is the consistency of loose mayonnaise. This will take about 8 minutes. Store in a covered jar until ready to use. This will keep for weeks! *To make sure it is right, put some on the back of the wooden spoon and run your finger through it. It should leave a clear line where your finger was. Much like pudding. « Football Season is Upon Us! What are you Making for the Big Game? stupid question – use the zest? I don’t but if you like an extra lemon kick feel free to use it! I think lemon is my favorite flavor of all!! I have always wanted to try my hand at lemon curd, but haven’t. UNTIL now!! Totally making this! 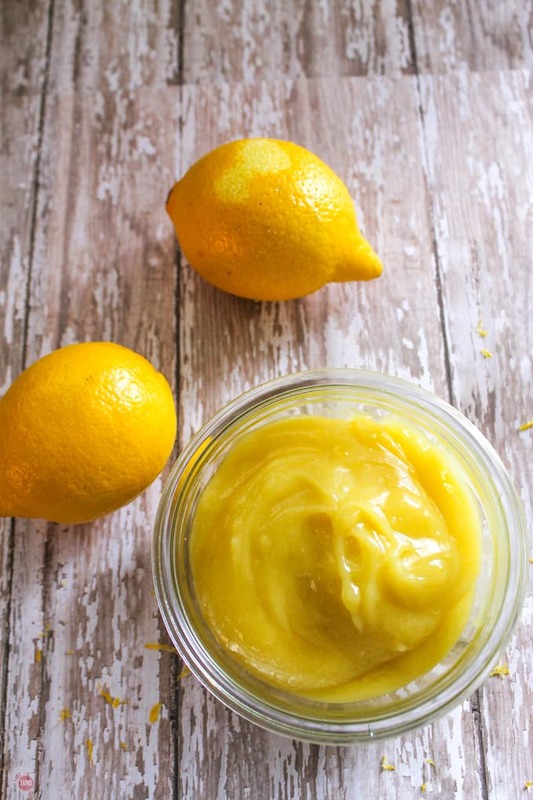 This has to be the perfect lemon curd recipe! I love how quick and easy it is to make! I love homemade lemon curd! I would have never thought it would taste so good on carrot cake. Now I’m going to have to pair lemon curd with your mini carrot cake cupcakes! Lemon curd is so versatile – I really love that sweet tart flavor and your recipe look just luscious! I love everything lemon! 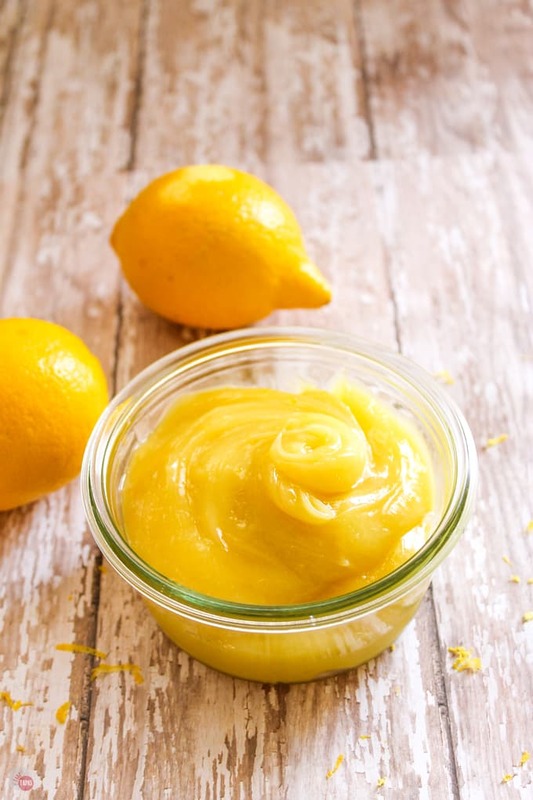 Great recipe for an easy lemon curd with so many uses! I love lemon curd paired with a simple shortbread cookie! I’m glad I know how to make a double boiler since I couldn’t find your instructions. Also, I’d like to know the temperatures, i.e., start at low, increase to medium 0r something else? For how long at a particular temperature? Thank you for letting me know. I mentioned the double boiler but did forget to talk about it. I’m sorry. I mentioned the temperature for the final lemon curd product in the story but now know I should put it in the instructions too. Thank you for pointing that out. The temperature at when it thickens is around 170F. I like to keep an eye on my lemon curd and use the back of the spoon test a few times to make sure it is the thickness that I need. Let me know if I can be of any more help! Who can think that the idea of making lemon curd to you came 30,000 feet above the ground? This curd looks tasty, I’ll try this citrus flavored curd. I had a carrot cake with a cream cheese frosting while on the plane. One of the few times I got to sit in first class. The small piece of carrot cake was minimally topped with the frosting and then it was drizzled with a lemon sauce. Not sure why they did it but the flavors worked. It was OK for plane food so I thought that I could jazz it up a bit wiht some full on lemon curd. 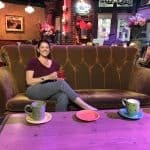 Thanks for reading and let me know if you get the chance to try it! I don’t need cake as an excuse to eat lemon curd…just give me a spoon! Having said that, I think this would be boffo great with carrot cake! Going to start trying it with other things! I had no idea you could make lemon curd so easily and quickly! It’s one of my favorite dessert flavors, this curd will be perfect for the mini cheesecakes I’m making for Easter next week! Also, what a sweet gift your mother in law gave you, family recipes are the best! For sure! It will turn out great and be a big hit! Thought I’d let you know that I was just able to order Southern Sideboard from Amazon used for 40 cents plus shipping. Can’t wait to see it. I love a great cookbook! Since I’m just seeing this post I must know what you made the next Thursday. Thanks! I haven’t researched it to see! Bell’s best is another good one! Homemade lemon curd is like a zillion times better than store bought, my lemon tree is full of lemon so I definitely want to make this soon! I just got a lemon tree so I am hoping for a big bounty! I loooove lemon curd! I became hooked on this stuff while living in England for several years and have been making it ever since. So good on scones or toast and I love adding it to baked goods. I love that I can make quick tarts with it and it keeps for a while! I’ve never made lemon curd before, but I am obsessed with lemon in my food. I so want to try this and I am going to! Thanks Michelle! You can use it for so many things! 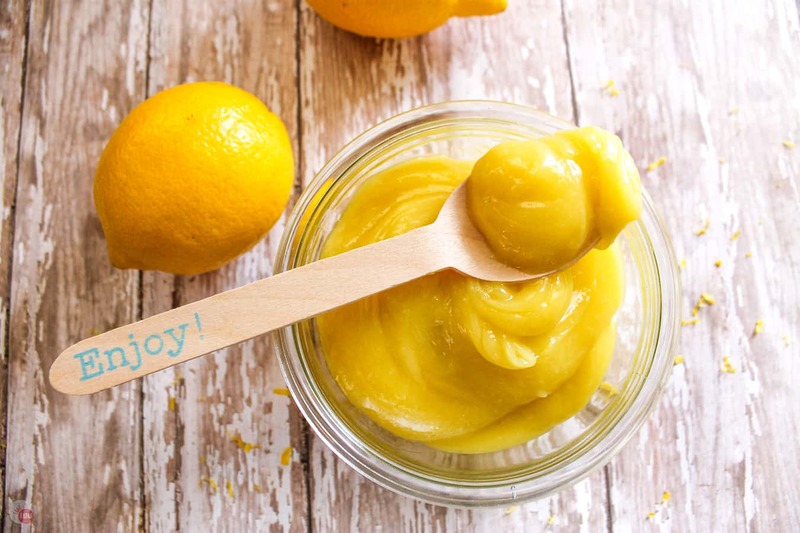 This is such a pretty lemon curd and what a thoughtful gift from your MIL! She is pretty great! I am blessed! I love your blog – so many fun and delicious recipes! Thanks again for sharing another amazing recipe at #TryaBiteTuesday – come see us again next week and have a fabulous week! Thanks for hosting! I love coming!! Just gimme a spoon! I LOVE Lemon Curd! Now I definitely want to try it with carrot cake. Lemon curd is totally one of my guilty pleasures! It always takes me forever though. Love that this recipe is a quick one, thanks! This recipe looks like an instant classic! I’ve been wanting to make some powdered donuts lately – this filling would be the perfect touch! Perfect use for it! The tart will balance out the sweet doughnuts! You’ll be hooked Dee Dee! Think of all those “fancy” desserts you can make! Would you believe that I’ve never made a lemon curd before? Thanks Winnie! This would go great with any of your beautiful desserts! You had me at 10 minutes! This curd looks delicious and I think it would be a great gift as well for holidays. I never realized making lemon curd was so easy. This is a great recipe. I’ve never had lemon curd but since I adore lemons I think I am going to have to try this. I can’t wait to see what you use it with on Thursday! Thanks! It’s like a tart lemon pudding but not as creamy. I use it for doughnuts, tarts, or just on a piece of toast:) Check out today’s post to see what I used it for!